I started making my choco coconut bites on Friday and kept them in the fridge so that I could coat them with chocolate the next day. However that was not possible as there was no water! We woke up in the morning to find our taps dry. Everyone came out of their apartments to find out what the problem was. The pump had broken down and it was going to take a while to repair it. How many homes in Mombasa have to store water in jerricans, buckets, huge plastic containers etc. I bet most of us. With the new government and each county having its own governing body, we had high expectations. But unfortunately things just seem to be getting worse, water problems, power cuts, roads full of potholes, insecurity. These are just a few of the problems. Everyone hopes that things will get better but when is the big question. Coming to the recipe, my two secret ingredients were chocolate and milk powder given by Srividhya Balaji. The first thing that came to my mind was barfi, but have already blogged that. I decided to make these chocolates, one more recipe ticked off from my hand written recipe book. Next time I rather make them using fresh grated coconut as opposed to desiccated one to get a more coconut taste. Sift milk powder and powdered sugar together. Add maple syrup, coconut, vanilla extract, butter and fresh milk. Mix to make a soft dough. Wet your hands with water if necessary and make balls with the coconut dough. Take about a tablespoonful. Roll into a ball and flatten it slightly so it looks like a disc. Put the discs in the fridge for 30 to 60 minutes. Melt chocolate in the microwave oven or over hot water. Line a tray with parchment /greaseproof paper. Coat each disc with chocolate using a spoon and fork. Put them on the tray. Sprinkle with chopped nuts or sprinkles. Let it set in the fridge for 1 hour or so. Store in the fridge if the weather is hot. Put grated or chocolate chips in a heatproof bowl. Place it over a bowl or pan of hot water. Stir till it melts. I mixed dark and milk chocolate. Add a flavouring of your choice. Dip the ball or disc into the chocolate and remove it with a fork. Shake the fork gently to remove excess chocolate. Make shapes from the coconut dough of your choice, small round balls or squares. 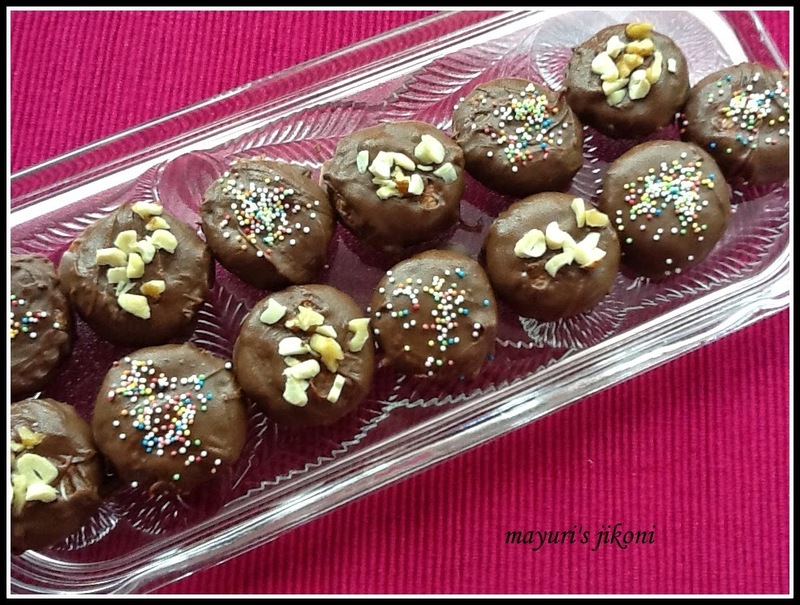 wonderful choc bites, made it perfect!!! Am ready to munch some anytime, dangerously addictive bites..